One of my favourite entries in the Sandy Denny/Fotheringay competition told of the night in Manchester when, having endured a million cries for Banks of the Nile, Sandy called out, as encores were demanded, something like: "So you want Banks of the Nile?" And then launched into Memphis Tennessee. I am off to the Banks of the Nile, on holiday, without calling into Memphis or passing Go. There is lots to read here if you wish. You can even say something, by way of a Comment, on any posting that appears here. Back early December, with pieces on Bellowhead, year-end critics' polls (I'll declare my choices) and more. Oh yes, and much more on Fotheringay........à bientôt. Another competition is over. No late flood of entries, but I am grateful to those who did take the trouble to post memories of or anecdotes about Sandy Denny in any of her guises. As I readily acknowledged (at Mudcat), the prizes - copies of Fotheringay 2 for the three entries judged by me to be the best - were modest. So the response, here at at Mudcat and Talkawhile, was respectable. I enjoyed reading each reply, and hope that some Salut! Live readers will have followed the link to Philip M Ward's excellent appraisal of Sandy's life and work. Philip's posting did not, however, count as an entry to the competition. It is not a well kept secret that Salut! Live is a huge fan of Sandy Denny. She was not only an enthralling singer, the beauty of her voice enhanced by that hint of vulnerability. She also wrote some outstanding songs. When she left Fairport Convention for the first time, it was to form Fotheringay. They made one album, started work on a second and then disintegrated. Sandy had succumbed, with massive reluctance according to those close to her at the time, to mounting pressure to embark on a solo career. The pressure was not surprising. 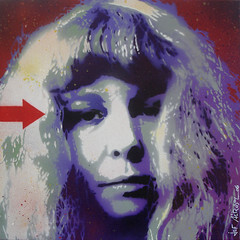 We love to claim Sandy Denny for folk and folk-rock, but her appeal crossed these boundaries we impose; she'd won two female singer of the year awards in a mainstream pop setting. One argument could be that she made the second Fotheringay album when she invited the musicians she had worked with in the band to play on her solo debut. But now, 38 years after Fotheringay first started laying down the tracks of the follow-up to their first record, Fotheringay 2 is available. I will tell the story, of how it has come about, in greater detail as a later stage (for those not already familiar with it). But for now, why not claim one of the three free copies the issuing record label, Fledg'ling, has made available for this site.